On Saturday May 11, we celebrated our May Milestone #4, the high school graduation of Matthew, youngest of three and the only son of my brother Mike and his wife Sonya. Matthew and two of his fellow homeschooled friends comprised the 2013 graduating class. 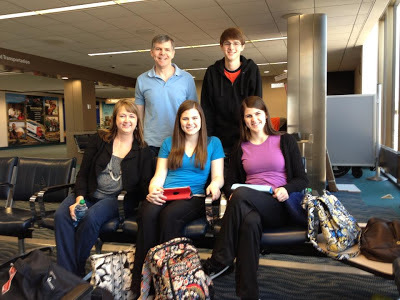 His homeschooling group is an outreach ministry of Restoration Church in Hampton, Virginia. The moms in the homeschooling group orchestrate the graduation and reception each year. One of their graduation traditions is that each graduate’s mom prepares her son’s or daughter’s food requests for the reception that follows the graduation. 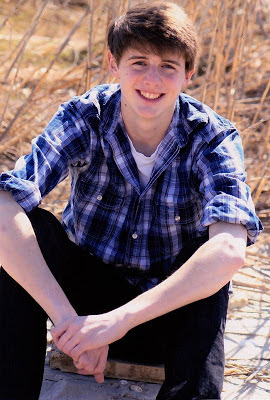 Sonya commented that Matthew, the last of the three siblings to graduate, had easy-to-fulfill requests: Chick-fil-a nuggets, chips, Rotel cheese dip, fruit and . . . bacon? Yes, bacon. And the reception guests consumed all but about two slices of the six or more pounds Sonya prepared. Of course, Sonya is great at adding special treats, in this case chocolate graduation cap suckers and Hoho diplomas. I failed to take a photo, but I did find the photo above and directions on Skip to My Lou craft site here. 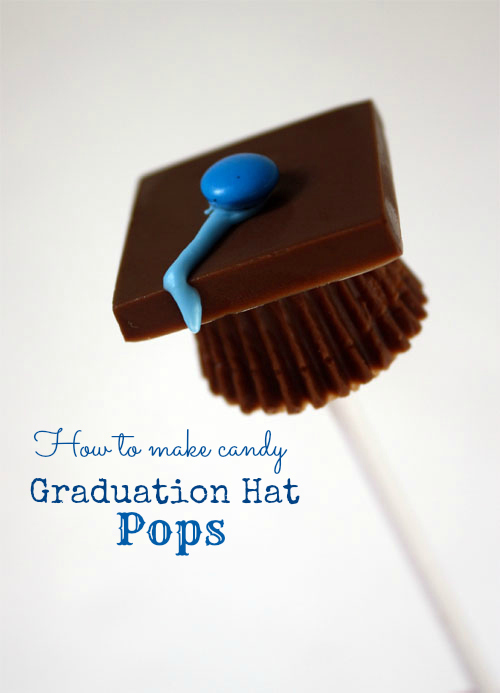 A caramel-filled chocolate square for the mortarboard, a mini M&M for the button on top, a narrow ribbon of fruit rollup for the tassel and a mini Reeses peanut butter cup for the cap part. Yum! 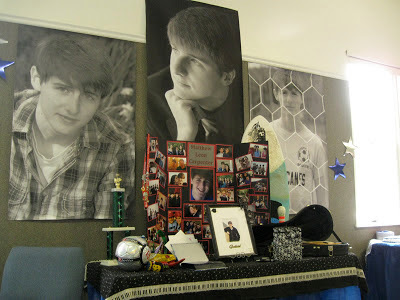 In addition to festive decorations in the group’s blue and white colors, the homeschooling moms and families had set up individual displays that reflected each graduate’s interests. Photos and memorabilia offered friends and family a chance to browse a sampler of a graduate’s school days and pen congratulatory notes and sign the mat of a framed photo. Music, soccer, faith and friends dominated Matthew’s display. He seems already on the road to a future that fits the role of music and faith in his life. He has been serving for more than a year as worship leader and director of the praise band at Reformation Christian Fellowship, his and his family’s church, and as leader of the youth praise band at Restoration Church for about three years. This fall he plans to attend Boyce College, a part of the Southern Baptist Theological Seminary in Louisville, Kentucky, and enter the Boyce worship and music studies program. 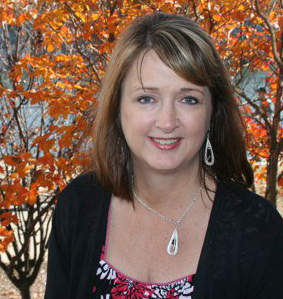 Sonya has been Matthew’s principal teacher and has also taught science and algebra for the homeschooling co-op group. The day following graduation was Mother’s Day, and the investment of the homeschooling moms in the lives of all the children in the group added another dimension to my thoughts of special mothers. Here’s a belated hats off to all those homeschooling moms and to all women everywhere who provide mother hugs and nurturing for their own children and others who are not their biological children. Graduation weekend Sonya was the epitome of that kind of mother in action, her heart and home open wide to welcome and nurture her grown and almost grown offspring, their friends, kin and those “grafted-in” kin gathering to celebrate Matthew’s milestone. We departed Hampton in the rain on Sunday, May 12. But I left with sunshine in my thoughts and abundant memories of happy times with Matthew, his parents, sisters and the special friends who joined the celebration. Awaiting a flight to begin an after-graduation vacation to Italy are the graduate, his parents Mike and Sonya, and his sisters, Amanda, front center, and Becky. NOTE: All photos except Matthew's memories are borrowed from my relative's Facebook sites. He is just the cutest!! And oh my gosh, Italy! But he really deserves it, all his jobs at the church, which are usually reserved for much older people, he is just exceptional. Congratulations to the graduate and his family.